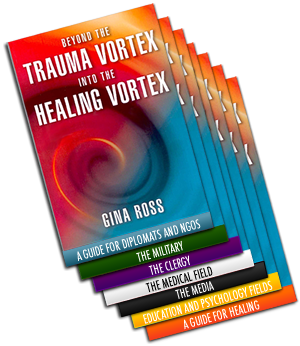 Gina Ross, MFCC, is founder and president of International Trauma-Healing Institutes in the United States and in Israel and the co-founder of the Israeli Trauma Center at Herzog Hospital in Jerusalem. An internationally known expert on the impact of trauma in conflict between groups or nations, Gina has specialized in cutting-edge healing methods that can be brought to the public. Also a pioneer in understanding collective trauma, Gina has integrated her wide expertise in cross–cultural issues and relationships and is currently working with Israeli and Palestinian societies and other groups to bring an understanding of the role of trauma in conflicts between groups or nations, how this role and cross –cultural misunderstandings relate specifically to politics in the Middle East. She has developed The Ross Model, applying the new healing paradigms to heal collective trauma at national and international levels in order to create a collective emotional foundation for peace. Gina and her institutes work diligently to place the issue of trauma healing on the global agenda, developing resources and collaborating with organizations to further healing at the community, national, and international levels. ©2010 Ginaross.com. All Rights Reserved.